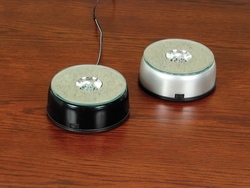 Combination LED 7 Light Base and Turntable with a Black Base. It measures 4 1/4 X 2 inches in height. The LED lights include 2 red, 2 yellow/gold, 2 blue and 1 green. When operating with 3 AA batteries, LED's light up. When operation with included AC adapter, base will also rotate. Top is mirrored.